Questo comodo e centrale appartamento all'ultimo piano, situato nel villaggio sportivo, ha nuovi pavimenti in travertino ed è vicino a tutti i servizi che lo Sports Village ha da offrire per una vacanza davvero memorabile. Non c'è bisogno di cercare oltre! Questa casa sembra davvero una casa lontano da casa. Perché stare in un hotel quando si può soggiornare in un condominio immacolato e situato in posizione strategica con ottimi servizi inclusi e per un incredibile prezzo ?! La Great Room è luminosa e ariosa con soffitti a volta e una TV a schermo piatto con un lettore blu-ray e un cursore di vetro che si apre sul balcone visto. La cucina è attrezzata con tutti i piatti, pentole e spezie di base necessari per preparare un pasto delizioso. La camera da letto ha un letto matrimoniale, TV a schermo piatto con lettore DVD e una porta di uscita al balcone pittoresco visto. 2 lettini pieghevoli sono forniti (nell'armadio vicino alla porta d'ingresso) per bambini o adulti e possono essere facilmente aperti nella Great Room. Il bagno ha una porta d'ingresso dalla camera da letto e dalla camera grande, una cabina doccia piastrellata, servizi igienici, vanità e una combinazione lavatrice / asciugatrice impilabile insieme a sapone da bucato. Sapone, shampoo, carta igienica, asciugamani di carta e filtri caffè sono forniti per iniziare per la vostra convenienza. Questo condominio ha servizi incredibili con una bella piscina, vasca idromassaggio e piscina per bambini situato vicino alla club house. Dopo una divertente giornata di nuoto e divertimento sotto il sole, perché non cucinare alcuni hamburger sulla grande area barbecue coperta dove ci sono un sacco di barbecue, tavoli e sedie disponibili. Una bella piscina olimpionica con vasca idromassaggio è anche un'opzione per coloro che desiderano una piscina per soli adulti. Sono disponibili anche shuffleboard, pickle ball, campi da tennis e racchetta, oltre a una club house con una sala giochi recentemente rinnovata. Questo condominio ristrutturato, all'ultimo piano del villaggio sportivo ha soffitti a volta ed è vicino a tutti i servizi che lo Sports Village ha da offrire per una vacanza fantastica. Non c'è bisogno di cercare oltre! Sembra davvero come a casa lontano da casa. Perché stare in un hotel quando si può stare in un condominio immacolato e conveniente con ottimi servizi inclusi e per un incredibile prezzo ?! 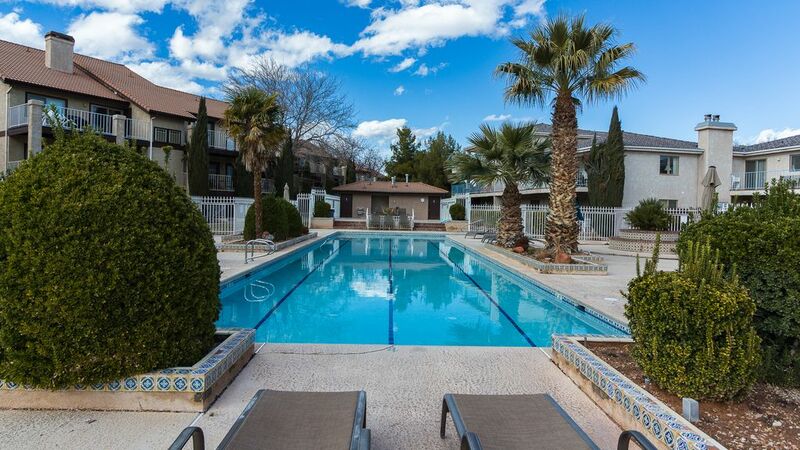 We loved how well it was stocked, that it was updated with quality in mind, and the cleanliness of the entire condo. All dishes, etc were clean and everything worked very well. We were comfortable at first sight and it lasted the whole week! It was a great time for our family. Thank you for allowing us to share this time together. The condo was ready as promised. It was clean, comfortable, and everything worked. The complex had ample amenities. We enjoyed watching the sports amenities from our balcony. We see a return visit in our future. Thanks for sharing your home with us and giving us lots of great memories. Great little condo for the price; had everything we needed. A great little condo for the price. Had everything we needed. Only complaint was we ran out of hot water for showers quickly. My daughter and I spent Thursday to Sunday and went to all three shows at Tuacahn. It is a five with a couple fixes. First, the bathroom door doesn’t latch. I was with my daughter in a one bathroom condo, and a secure door would have been nice. Second, the shower head is all clogged. Just needs a clean or a replacement as only one setting works. The linens are basically hidden on the back side of the kitchen island. It would be nearly impossible to find in the first place, but there was a bar stool in front of the label on the only door on the back side of the kitchen bar. The keys to the adult pool were missing, so we needed to make another call to Troy and in the end, we ended up going to the front desk to swap out a key fob for a key to the adult pool. In the end, Troy got it all figured out in a timely manner, and the place is perfect for a weekend getaway. Just can’t give a 5 with the issues we encountered, but if those things are fixed, it is a five. Also, I know it is St.George, and is very religious, and very Mormon, but it is kind of sold to you. “LDS LIVING” magazine sitting by the couch, magnet on the fridge, hangings on the wall that all discuss religion. I guess a rental property shouldn’t be a resource to pass along your beliefs. It would be like having political posters in the place to pass along your political beliefs. Maybe just me. May not bother most. Good place, and good complex. Thank you for staying in our home. We are glad it was a relaxing getaway for you and your daughter. We will replace the pool key right away and update the check-in instructions to make the location of the linens more clear. We apologize for any inconvenience the door knob caused and appreciate you letting us know so it could be repaired. The shower head has also been addressed. Thank you again for your helpful feedback. We loved this quiet, clean place. Remodeled look is great. Two TVs were awesome, especially the fact that the one in the bedroom was large enough to be watchable from the bed :). The host was super to work with! Would definitely stay here again! Thank you Jed for your great review! We're so happy to hear that you found our place to be comfortable, clean and convenient. We hope you'll choose to stay with us again if you're back in beautiful Southern Utah!